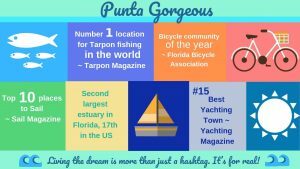 Discover outdoor living and hometown hospitality in the beautified town of Punta Gorda. A place where you can set your sail. 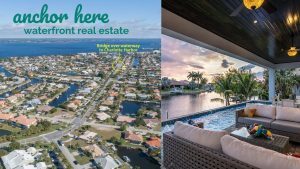 We are the Berson Team, waterfront real estate experts serving Punta Gorda, Charlotte Harbor, Englewood Beach, Boca Grande and Port Charlotte markets. “Navigating your move unruffled & perfect. Royal palmed lined streets, tin roofed neighborhoods, perennial gulf winds and a quaint seaside downtown draws sailors, anglers and boaters alike. Adventuresome is personified here, patriotism is flowing, a bounty of organic locally grown produce, tournament fishing, regattas and festivals galore, cyclists and pet friendly parks link the landscape. Foodie deliciousness flourishes at farm-to-table restaurants. See this small town in Florida’s magnetic appeal. Punta Gorda is located on Florida’s Gulf Coast with quick like a bunny access to Interstate I-75. Perched directly on a 270 square mile prized estuary where the Peace River and the Myakka rivers connect to the Gulf Islands and beyond. An impressive bridge connects Punta Gorda to Port Charlotte where the new Sun Seeker resort is now underway. The Punta Gorda airport and Allegiant Airlines provide low-cost, nonstop air service to approximately 43 destinations. Southwest Florida International Airport to the south and Tampa International Airport to the north are options as well. Whatever your mood, your options are endless. Grand slam fishing, cruising, sailing virtually from your back yard. Walking and biking promenades including a 17-mile path around the city draws you into the sun filled activities. The special allure of the welcoming safe atmosphere draws Olympian anglers, families, ex-military, veteran pilots, seasoned sailors and retirees alike to this charming harbor front town. A cold brew coffee, fresh music, a chill park ~ the thick of whatever you love. Here is the locker of hip happenings and boutique shopping – starting with the pristine parks, arts and culture, the foodie scene, the music in the street’s nightlife and its variety. The acerola cherry on top – the Peace River, how fitting, you’ll be immersed in the serene vibe here. Tucked away are the expansive and deed restricted neighborhoods of Punta Gorda Isles and Burnt Store Isles. Featured are over 131 miles of navigable canals that lead to the Pine Island Sound and Gulf of Mexico. Whatever lifestyle suits you, there are several home options available. From affordable condos, single family homes, villas, vacant home sites, new construction to luxurious estate properties. Most with water views and downtown amenities at your fingertips. This Isles lifestyle is located west of Hwy 41 so you can choose to avoid the hustle and bustle and bask in a magical haven of boating and golfing fun. Let the Berson team present you all the nuances of Punta Gorda Isles and Burnt Store Isles. Once upon a cozy close-knit town…if your dream includes living in a boater’s paradise where you can still hear quiet, and leave your front door unlocked. If you are more suited to a community where people have the time to wet a line, enjoy a sunset cruise or play a game of pickle-ball, then Punta Gorda is just right. We just found your happy place!